Stone Spectrum Monuments is dedicated to helping you find the perfect memorial that honors the legacy of your loved one. We guide you through the process of finding or designing just what you are looking for to celebrate the uniqueness of the life you have lost. We work directly with the artisans and carvers to get you the highest quality at the best possible price to make your memorial truly unique. Due to weight and size, this item will ship freight. We can offer the best shipping rates to a commercial location with either a loading dock or forklift available. If neither is available, the shipping rate may increase as we will be required to order a lift gate to insure the safety of your delivery. You can also pick up the monument or arrange your own shipping if you desire. Please contact us and let us know which option you prefer. We ship to the 48 continental states. Handling times vary based on the details of the project. We have several different sizes, styles, and colors available. If you do not see a monument that you like, please contact us and request a free quote for custom ordering whatever you are looking for. Custom orders may take more time to acquire once the order is placed. Provide us with the information, ideas, pictures, fonts and we will design a rendering of the stone for you with a quote for pricing. The design work is free and there is no obligation, we just ask that you respect the proprietary nature of the design. Babies embody our love, dedication, and trust in a promising future. But there is such heartache when a child is taken from this world, that it is often hard to cope with the loss. What can you do to help the survivors find a lasting way to commemorate their child? How is it possible to honor the enormity of a child’s death while still moving forward with life? One powerful way is to join together to make a Child memorial, what Judy Tatelbaum, author of the bestselling book Courage to Grieve, calls "something concrete, a way to remember together." Baby/Child memorial is a lasting memory to a loved and departed child. Baby headstones not only can memorialize the life of a child, but also help families who have lost a child cope with the suffering. Child memorials are almost always decorated according to the universal themes of childhood. They typically are designed with the goal of capturing the child’s happy, fun-loving, innocent spirit, and displaying that spirit for the ages. Pacifiers, baby blocks, hearts, or other symbols of the carefree days of childhood are typical parts of the design of child memorials. With our Children & Baby Granite Grave Markers, you can memorialize your loved one forever. 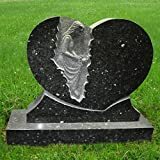 All the Memorials and Headstones are make of granite and marbles, the best material of choice for headstones and grave markers. You can select the design from the following pictures, or send your own design with picture or drawing for personalized production. Tagged angel memorial stones, baby monuments. Bookmark the permalink.